Dogwood trees are some of the earliest flowering ornamental trees grown in the United States. They are known as understory trees. This means that in the wild, they grow beneath the canopy of taller trees such as oaks. Dogwood trees grow well from cuttings or seedlings, but only transplant well from container-grown plants, due to the tree’s unique root system. Dogwoods are adapted to growing as shade trees under the canopy of taller trees. In this climate, dogwoods receive filtered sunlight, high humidity and protection from drying winds. Wild dogwoods are heavily mulched by the leafmold layer that falls to the floor of the forest. This helps the shallow roots of wild dogwood trees to thrive. To grow a dogwood in your landscape, select a location with morning sun and shade from midday through evening. Plant trees in well-drained soil and cover the roots with a layer of mulch. There is very little chance that a dogwood transplant selected from the wild will survive in a home landscape. Most dogwoods grown for landscaping purposes are grown from seed in containers. Wild dogwoods are poorly shaped and their root development is often as uneven as their top growth. Dogwoods that are transplanted from the wild should be root pruned a year before transplant. 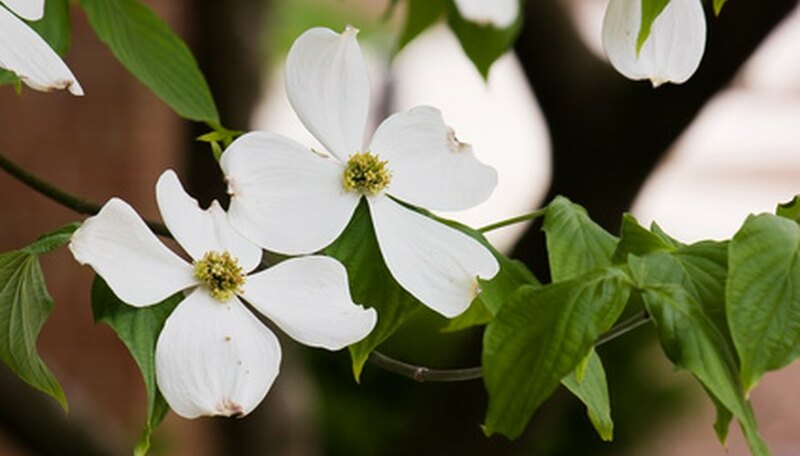 For a better success rate, you should purchase your dogwood transplant from a nursery, or grow it yourself from seed or from a rooted cutting. Purchasing nursery-raised trees will also help prevent damage caused by diseases such as anthracnose, which is often spread through trees taken from the woodlands. Dogwoods have a very shallow root system. Because of this, dogwood trees are among the first trees to show signs of drought stress. To overcome potential damage caused by drought stress, newly-planted trees should be watered so that their soil remains as damp as a wrung-out sponge. You should also water trees during periods of serious drought to avoid injury. Healthy, well-maintained dogwoods rarely have problems with insects. Major insects that can affect dogwoods include dogwood borers, aphids, leaf miners and caterpillars. To avoid these insects, plant dogwood trees in partial shade and well-drained soil. Water and fertilize trees regularly and avoid injuring the bark of trees by mowing around them. Never wrap a tree when you first plant it. Dogwood borers infect new trees more often if they are wrapped at the trunk. What Are the Treatments for Borers in Dogwood Trees?